Over the last couple of months several improvements landed in Pontoon. Let’s have a look at some of them! Pontoon now allows you to translate strings across all projects in a single translation interface. 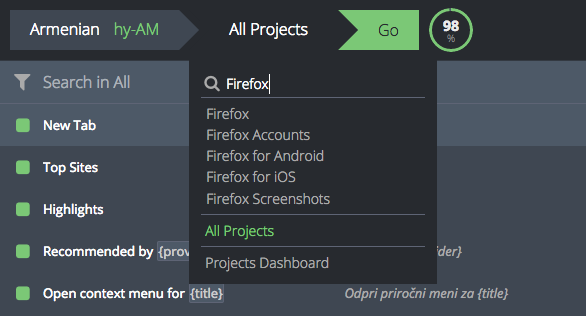 Select All Projects from the project menu and all the strings being translated to your language will show up in the sidebar. Many users have expressed interest in such feature, which helps you work on all untranslated strings in one go, or review all pending suggestions submitted by your team contributors. It’s particularly handy when working on consistency: you can now easily search for inconsistencies in your Firefox Desktop and Firefox for Android translations for example. We’re changing the default search behaviour to search for each word separately and show results that contain all of them. That’s closer to the default behaviour of search engines. Finds strings that contain Firefox Beta. To search for exact matches of multiple words, you need to wrap them in double quotes ("). If you wrap the entire string, the search behaviour is the same as in the past. Finds string Open in a New Window. If you want to search for strings that contain double quotes, you can escape them with a backslash (\). Searches for <a, href=, %(url)s and >. Searches for <a and href="%(url)s">. Thanks to Vishal Sharma for contributing this and many other features over the last few months! One of them is also the ability to see the size of a project when requesting it. Pontoon now has the ability to link to the translate view without specifying the locale. It means that you might encounter links like https://pontoon.mozilla.org/projects/firefox/all-resources/ in project announcements, which will redirect you to the translate view for the “right” locale – guessed from your user and browser settings. Thanks to Mai Truong for contributing the patch! Finally, Pontoon allows you to change your email address! Simply go to your settings page, type in your new email address and log in with a new one. Thanks to karabellyj for contributing the patch! Tags (AKA string tiers) will help with organizing strings by priority. Unreviewed suggestions will be made accessible from dashboards. Compare locales checks known from l10n.mozilla.org will be integrated into the translate process. Afterwards, errors and warnings will be displayed on dashboards. Thumbs up to Jarek for turning this long awaited feature into a reality! Stay tuned for more updates and feel welcome to join the Pontoon community!